Offers a DERMS platform to manage various types of distributed energy resources (DERs) for utilities in order to provide grid management or virtual power plant (VPP) aggregation for participation in grid services Has designed its platform to manage a wide range of DERs, including flexible loads, ... read more. Develops generative design software products for 3D printing Products include Element Pro software and the nTopology Platform Differentiators include the nTopology Platform's independence, combinatorial geometric representation technologies, and simulation-based and function-driven design ... read more. The company was founded by Yu Wu (CEO), Yunfeng Liu (CTO), Linding Wen (Product Director), and Hu Xiao (Marketing Director); three of the four co-founders previously worked at Tencent and have solid technical backgrounds in deep learning, natural language processing (NLP), and search engines. So far... read more. The company was founded by Abraham Heifets, Izhar Wallach, and Alexander Levy in 2012; Abraham serves as the CEO, Izhar as the CTO, and Alexander as the COO; all three of them appear to have extensive experience in machine learning; Alexander also appears to have had some experience starting a ... read more. The company offers a patent search and patent landscape analysis tool targeted at nonexpert customers (e.g., an engineer in a research and development organization, as opposed to a patent lawyer) The company claims that Teqmine's technology is differentiated by its easy-to-use user interface, ... read more. Uses proprietary speech-to-text engine to process audio content and generate text; also uses human-in-the-loop to edit the text so as to improve the accuracy of results to 99% and improve performance of the engine via adaptive learning Engine usually needs two to three months and 1,000 hours of ... read more. The company was started by Viswanath Avasarala (CEO) in 2016, who previously worked at relevant companies including GE Research, Schlumberger, and SAS and has technical expertise in machine learning and big data analytics as well as some entrepreneurship experience; the company has not publicly ... read more. Develops software solutions that use natural language processing and machine learning algorithms to automate the analysis and synthesis of large text datasets, which includes extracting information, identifying key insights, and generating output as human-readable text and graphics Provides value by... read more. As we described in a recent report, many of today's applications of AI involve supervised pattern recognition capabilities like image classification or speech recognition. Moving beyond these capabilities to more complex human tasks requires higher levels of reasoning and planning to not just ... read more. Last month, Lux co-organized the Materials Informatics for Industry conference with the National Institute of Standards and Technology (NIST) and the Center for Hierarchical Materials Design (CHiMaD) at Northwestern University. NIST is part of the U.S. Department of Commerce and is the lead ... read more. In the last few years, synergies between the design software space and 3D printing have become increasingly apparent. For example, generative design software takes advantage of 3D printing’s ability to expand manufacturability and vastly enlarges the explorable design candidate space. 3D printing simulation software models the stress profile of a part, and therefore predicts part failure before physically printing it. Within the 3D printing community, we are seeing a trend of 3D printing companies developing and strengthening their software components. Several major examples include Desktop Metal’s software for generative design, Markforged’s cloud-based software for part print optimization, and Arevo’s computer-aided design (CAD) and FEA-based software for 3D printing design and simulation. In this report, we review the most relevant 3D printing software technologies and argue that the formation of a 3D printing software thread (design, simulation, manufacturing, as well as workflow management and data security) with data control through the whole process will be crucial for 3D printing at industrial scale. We expect to see more 3D printing companies either develop their own software strategies or to partner with large software companies in the near future. Lux covers the potential for sustainability and green technologies to become an alternate source of revenue as concerns regarding environmental impact and risk continue to grow. In our recently-published "Decarbonizing the Industrial Sector" report, we introduced carbon capture as a key technology that will allow multiple industrial sectors to decarbonize their operations by capturing CO₂ emissions from point-sources. In this report, we will look at the cost of carbon capture using multiple configurations, as well as the regulatory framework support needed to support the adoption of carbon capture in the industrial sector. Natural gas is often touted as the fuel that will power the ongoing energy transition. Several energy companies such as Shell, Total, and Qatar Petroleum have committed to expand their gas and LNG businesses, with the latter even quitting OPEC in its pursuit for gas. However, as industrial demand sectors such as power, steel manufacturing, paper, residential heating, gradually move towards disruptive, low carbon solutions such as hydrogen, heat pumps, and electric heating, the outlook for gas needs to be revisited. In this report, we connect the dots between the various pieces of the broader energy system, and analyse the collateral impact of emerging technologies on the global gas and LNG markets in the near future. 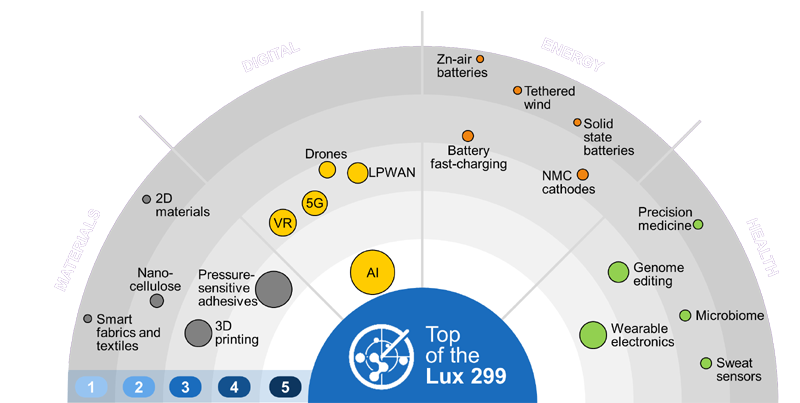 Demand for 5G electronics and the emergence of the internet of things have created new demand for materials that offer higher performance but are cheap enough to enable rollout of millions of new devices. This report will identify new materials technologies in polymers for electronics and thermal management, as well as the technology developers behind these efforts, and pick winners for commercialization. Corrosion remains perhaps the most persistent challenge we face in the materials industry. New sustainability regulations are making this even more challenging, by pushing out chrome 6 and limiting the use of solvents. This report will scout early stage technologies, start-ups, and identify corporate approaches to tackling the corrosion challenge. The apparel industry is a huge market for polymers, coatings, dyes, and more, but the low cost tolerance and fast development cycles make materials innovation a challenge. However, there are increasing demands for sustainable products, differentiation, more functional clothing, and cleaner manufacturing. All this creates new opportunities for materials innovation; this report will highlight the most promising areas. This report will examine the theoretical advantages of industrial fermentation (scale independent, allowing for right-sized and distributed manufacturing; flexible production) and reasons for 2018 setbacks. It will examine the continued shift towards high margin products. This report will analyze the technical capabilities of existing metal 3D printers to: 1) define common use cases; 2) highlight further development areas; and 3) emphasize the caveats of metal 3D printing applications.